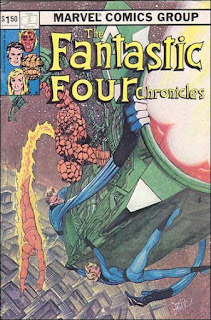 Here's an interview with Len Wein and Marv Wolfman conducted by Jay Zilber for The Fantastic Four Chronicles circa 1981. I republished it on my old FFPlaza web site in the late 1990s and thought I'd drag it out again for you here. (Read as: I'm drawing a blank on new content today, and didn't want to dip into the mashup well.) I always got a kick of how the two of the recap the FF's origin; it's almost like a performance piece in and of itself! Jay Zilber: What did it mean to you to be writing "The World's Greatest Comics Magazine?" Was it something you always wanted to do, or was it thrust upon you by chance? LW: ... me. I was the logical choice to replace Roy at the time. Gerry [Conway] was then over at DC -- as I recall, the sequence of FF writers was Stan, Roy, Gerry, Roy, me, and Marv. Since Gerry was not around at the time, and since I was doing, at that point, Spider-Man, Hulk and Thor, it seemed like it was the logical addition to the triumvirate of "biggie" titles, the old Stan Lee titles. I didn't last very long though... I did about a half-dozen issues. Marv Wolfman: And when Len got off the book. I had wanted it, because I like the Fantastic Four. LW: Oh, I liked them too, by the way. I didn't drop the book for lack of enjoying the characters. I left the company, as I recall. JZ: Those were the circumstances for both of you -- when Len left the book, you left the company. MW: No, I had actually quit the book before I left the company. I had said I would quit FF at a certain issue, before I even knew I was leaving Marvel. It just turned out that the issue I said I would leave on was at the same time I would have left anyway. I took on the assignment because Len got off, and it was a book I really wanted to write. I was given FF and Spider-Man at the same time. JZ: What were you trying to accomplish during each of your respective tenures on the book? Were you trying to return to the Lee-Kirby roots, or to be faithful to what had just preceded you, or to develop your own interpretations of the characters? MW: ...The feel that he was trying to get through, as opposed to just mimmicking what he was doing (which is currently what's happening in the book). It was that sort of a desire -- and also to go into other directions. You couldn't do another Dr. Doom story. You couldn't do just another Galactus story. If you were to use those characters, you had to do something totally different with them. LW: That's why I was trying to infuse a little bit of cynicism, by breaking them up -- in what turned out to be my last full issue, I wouldn't have been as presumptuous as that, to break up the group and leave someone else with the loose ends. I had planned almost a year's worth of continuity, where I would have done rotations. Every issue would have focused on one of the members, while the others would be in subplots, which would in turn build unt il they all came back together in a major story a year or so later. JZ: Do you think you having had control over Fantastic Four as both writer and editor was beneficial to what you were trying to do? How do you feel about that system, which has now been dismantled, as opposed to the separate writer/separate editor policy that you have at both DC and Marvel now? LW: I may be one of a dying breed, but I liked the writer/editor concept. I Iiked being able to do what I wanted to do without having to explain to somebody else why. MW: I find, personally -- and this is not always true, but for the most part -- that editors, because they have to answer to the company, tend to be very timid about experiments, and about trying something real strange. I didn't really do much on the Fantastic Four that would have been considered that way. But certainly some of the stuff I was doing on Spider-Man would not have been approved by any editor. It could only have been approved because I decided to do it. The same way, of course, Stan decided to do t hings that had never been done. He could do it. If he had needed the approval of somebody else, they'd have said, "Well, this has never worked before, this has never..." So I tend to feel that writers could be their own editor for ideas. They do need somebody to sound the stuff off of, and to go over the actual writing -- but that could be either a glorified proofreader or an assistant editor who has the power to make corrections. JZ: Have either or both of you followed Fantastic Four since you left the book? LW: Haven't missed an issue. MW: I missed one. It was one of Doug's [Moench]. I couldn't read it. LW: Oh, I'm sorry but he's right. It was possibly the same one. MW: With Thor [FF 225-RG]. LW: The second part of the... yes! MW: Couldn't get past the third page! LW: It was the only issue of Fantastic Four I could not read. The same one. I wonder what that tells us. MW: Doug writes Master of Kung Fu, which is one of the top three books up there. There are writers who are just not right for certain strips. JZ: In general, what is your opinion of what followed your work? How do you feel about what John Byrne is doing now? LW: I liked it when Stan did It. My principal complaint -- and I may feel stronger about this than Marvin -- is that I muchly resent what John is doing, I resent his implication that everything in the past 20 years hasn't happened, that it's still 1964. Everything he's doing is throwbacks to the past. I resent him tampering with so much of the legend. In the space of a couple of months, he's taken care of the Inhumans and moved them to the moon; he's taken care of a couple other things like that. It's really very imperious to suddenly decide to change so much that is integral to the whole Marvel mythos, as opposed to just a supporting character in a book. MW: He decided to change the visuals on his own, after all this time, when they're not changed in any other book. LW: He draws The Watcher the way he was drawn in the first story. Nobody else draws him that way. There's a whole issue The Watcher stars in, where he doesn't look the way he does in any other book. MW: John may be right; but unless it's company policy to make the change throughout the whole line, it's really wrong for him to do it alone. I did really like his triple-sized anniversary issue [FF 236]. I thought that was excellently handled. It was certainly not a traditional Marvel plot. It was a John Broome/Gardner Fox plot for DC, the way it was worked, But it was a very good story. MW: Various things like that. JZ: But to compare it to a similar situation, isn't what you did in Fantastic Four 200, writing off Dr. Doom in the way you did -- wasn't that a comparable alteration of the legend? MW: No, because I had already told everybody what the sequel was. The entire company knew where I was going to go with that story. Several people had wanted to use Doom, and I told them, "No, you can't do it until I've done this particular story," I had done a very straightforward science story about Doom, how Doom's personality was twofold. The second part of the series, which would have appeared about a year from that point if I had stayed on the book, was about Doom's people taking him down to Mephisto, to play on the sorcery aspect. So I was not writing Doom out of the book. I was just trying to write a type of story that you hadn't seen before in Doom. JZ: You were both involved in the series of Marvel prose novels, including Fantastic Four and others. MW: I wrote them, yes. JZ: And Len was listed as the "packager," which I assume has something to do with editing them. LW: No, I got to go around the country in a truck and hand them out to bookstores. MW: Basically, they didn't want the term "editor" or "producer" on the books. LW: We were going to use "produced and edited by," and they didn't like "produced by," because they wanted people to believe that Marvel had produced them -- which, actually, they didn't. Did they? JZ: How did you approach the problem of translating a concept that was developed for sequential pictures into a format of straight prose, and do you really consider that a valid thing to do? MW: My own personal feeling on it was that, when I wrote the Fantastic Four book -- which, I'm always quick to say, had to be written really fast for deadline purposes -- was basically to write an action/adventure story. I didn't think in terms of it being a comic book. I knew that I had to describe things that you would otherwise see in the artwork, but I treated it as just writing a story. I didn't see it as just trying to make a comic book come to life, or come to prose; I just saw it as writing a prose story featuring comic book characters. Certain things had to give way. For instance, in my first draft, I spent three chapters doing the origin of the Fantastic Four, as Ben Grimm is explaining it. But when you really analyze the origin of the Fantastic Four, it's dumb! It's incredIbly dumb! I can go through it, and probably have you on the floor laughing! JZ: Go through it, then! LW: ...Central City. The Flash wasn't around there, apparently. MW: Naturally, he tells his girlfriend that he's going to steal a spaceship, even though he was one of the scientists who designed it. He invites his girlfriend, his girlfriend's kid brother, and this big lummox of a pilot. Now that's understood that he had to invite Ben to fly it. Why he invited the girl and the kid on a mission that would technically cause them to be considered spies and traitors, for stealing a rocket ship...? LW: ...they're the famous "stuffed guards." They stand at the gate to frighten you away, but they're not real people. MW: Okay, so they somehow get past these two guards in this very well-secured area, and they get into the spaceship. Now, of course, spaceships do not require set-up, priming, using outside computers, any technicians whatsoever -- right inside the spaceship, they can blow it up! MW: So they shoot off into space, and Ben says, "You know, we have these cosmic rays," again. This is the second time he mentions it. Reed says, "No problem," as the cosmic rays start shooting at him. Why he built a spaceship that would not be shielded against cosmic rays, I don't know. But, okay, this is only the most intelligent person on Earth, as the story goes. They land. It crashes. Somehow, they survive. Nobody comes to rescue them, nobody has spotted them during this entire time. Let me see if I can get the order they discovered their powers correctly. Sue turns invisible. Okay, we understand she can turn invisible. Later on, of course, we learn she has to think about it, but there she must have been thinking about turning invisible. Johnny flames on and flies. Now, the first thing I would do if I had suddenly ignited would not be to fly. I would not ordinarily say, "Well, I ought to jump upwards," and attempt to fly. LW: You'd roll around on the ground trying to put the flame out! MW: And Ben becomes the monster. Now, the first thing he thinks of -- not yet even knowing what his powers are -- is to lift up a tree and attack Reed Richards. A normal human being would naturally think, "Well, I can lift up a tree!" But of course, Ben lifts up a tree. And of course, Reed stretches. None of this works! So I took three chapters from my first draft, in which I described all of this in more detail than I've just done now, and knocked it down to one paragraph wherein Ben says something to the effect of, "We went up in space, got hit by cosmic rays, and landed." That was the whole origin, because I was in hysterics as I wrote this stuff, realizing it was really dumb! Anyway, that's the only type of reworking that I had to do in my head, to take the things that didn't work, and fluff over them. On the other hand, Dr. Doom's origin did work, and it works very well in a pulpy style. That, I did spend the full chapters on. So where it works, you do it, and where it doesn't work, you just get around it. Otherwise, it was an action/adventure story. JZ: And that was "the world's greatest comics magazine." MW: And it was! They were doing things in there that no comic had done previously to that time. LW: For about twenty Issues. on either side of 50, it was possibly the best comic book ever done. MW: The best superhero comic, certainly. LW: Oh boy, I mean... the Silver Surfer, a throwaway character who wasn't even in the plot...! MW: The Inhumans, all of that stuff! The book really was the world's greatest comic -- for awhile, at least. It hasn't been for a long time, including the time I wrote it and including part of the time Stan wrote it, near the end. MW: No. What I had done was to start a storyline In both books. During the course of the storyline they cancelled Nova. The story had already begun in Fantastic Four. The idea was to have two separate stories In the two books that the readers wouldn't even realize came together until they met in one issue. When they cancelled Nova, I had to rejuggle the entire plotline, which is why it extended so long in Fantastic Four. Half the stuff I did in FF would have been in Nova, and nobody would have said, "Oh, this again." JZ: But do you think there's a danger in wrapping up plotlines of presumably unpopular characters in a popular book and possible damaging the popular book? MW: It's hard for me to say. I wouldn't go out of my way to do it normally. With the FF/Nova thing, it wasn't a wrapup of a storyline: it had begun on its own. We just did that in the Teen Titans, but it made sense because one of the members of the Titans was the adoptive son of one character in, and a member of, the Doom Patrol. But normally I wouldn't go out of my way. There are enough people out there who live and breathe that stuff -- let them do it. JZ: At the time you were writing Fantastic Four, you were also writing some or most of the other major Marvel titles Len, as you mentioned. you were doing Spider-Man, Hulk and Thor, and Marv was also doing Spider-Man and Dracula at the same time. Was there ever any concern that having the same writer/editor on the major books, in this fashion, tended to reinforce the notion of a house style? Or did you specifically structure the style of each book differently? LW: I don't think I wrote the four books very much alike. A house style is subjective, it's not a matter of whether it's good or bad. Every editor has his own Style. In fact, just this morning I was talking to my wife about the whole concept of editorial opinion and approach. You could pick up a Julie Schwartz comic -- any Schwartz comic, long before there were credits given -- and you knew Julie Schwartz had edited that book. Same thing whether with Murray Boltinoff, or Mort Weisinger, or God help us, Bob Kanigher... or Stan Lee! They all had their own styles as editors, let alone as writers. Stan simply reinforced his editorial style with his writing. because it was his style, and he was in charge of it all! MW: Even Stan did not write the Fantastic Four at all the same way he wrote Spider-Man or Thor. MW: You couldn't, because of its nature. Spider-Man had to be realistic, and funny. The Fantastic Four was more cosmic, even if they had "straight" stories. LW: Spidey's villains, as a matter of course, are not super-powered; or even the super-powered ones are super-powered at a lower level. ln the old days of Stan, there was never a super-powered villain, really. They had weaponry, but if you took off the costumes, they were just normal guys. The FF, on the other hand, fought Galactus, who eats worlds for a living! MW: Every time Stan created a super-powered villain for Spider-Man, they'd only appear once and then be put in another book, like Sandman. JZ: If the circumstances were different, would you like to be writing FF again, now or in the future? MW: I wouldn't have minded. As I said, I got off the book on my own because I didn't think I was doing the job I wanted. If I had the choice, I'd prefer getting on Spider-Man. That's the only Marvel book I really miss writing. LW: Yeah! I didn't necessarily like to give up any of the books I gave up when I left the company. It was a strange set of circumstances that lead me to leave. Unlike any time previously in my career, I had years worth of storylines for every one of those books, which had never happened before. I could have stuck with them for quite a while. I look to forward to reading any thoughts you might have on the 'black man in a mask with a gun' cover to the new Green Lantern. In fact I look forward to anyone's thoughts on that!